It was starting to look a little more promising since I could see quite a few Monarch butterflies flying among the trees. Not near as many as I was expecting, however. Was I in the wrong place? I approached an older couple out walking with their grandkids and asked them if they knew where to find the butterflies. Pointing me in the direction of a fence that overlooks the barranca along the edge of the park filled with Eucalyptus trees only few hundred feet away, they said they were easy to miss since they can be mistaken for dead leaves. As I walked along the fence the number of butterflies increased but not yet in numbers that could prepare me for what I was about to see when I peered into the clearing at the edge of the fence. 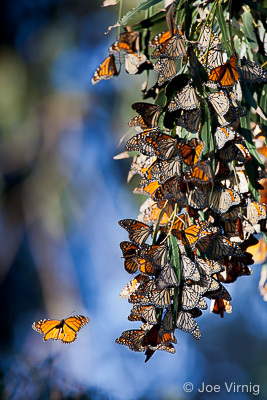 Before my eyes were suddenly thousands of butterflies flying through shafts of light filtering down through the trees illuminating even more butterflies covering hanging branches and leaves and forming huge clusters. I felt like I was in the middle of a National Geographic television program! They were not likely to be confused for dead leaves today! I was off to the car to get my camera equipment. I spent the next hour until the light started to fade taking photographs. Not great ones, though. As it turns out butterflies are far faster than I realized. 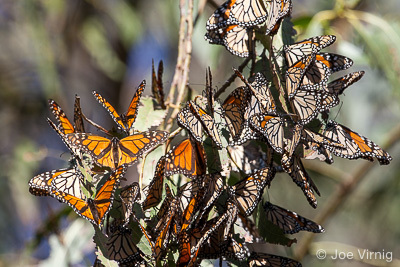 At the fasted shutter speed I had used that first afternoon—1/160 of a second, the Monarchs were just too blurry. Even at 1/1000 of a second you can still see movement! I’ve returned to take photos now several times with better technique and captured images I’ve posted here. You owe it to yourself to experience this wonder for yourself. Words can’t describe it and my photographs barely do this sight justice. To get to Camino Real Park, take Main Street east to Mills Road. Turn left onto Mills. Turn right on Dean Drive and turn left into the park entrance. Just as you enter the park, look to the stand of trees on your left. That is where you will want to head after you have parked. 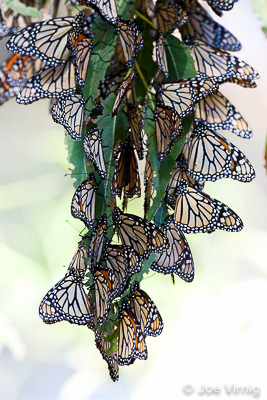 Don’t put off your visit for long since the Monarchs will be taking off in early March and you’ll have to wait until their return in November if you miss it. I hope you enjoy the experience as much as I did. I will be returning often. Joe Virnig is a real estate agent with 25 years experience helping locals and folks moving to Ventura County find the right home and community to fit their lifestyle and needs. He is also a photographer and an enthusiast of all things Ventura County. His portfolio of Ventura County images can be enjoyed at VenturaCountyVistas.com. 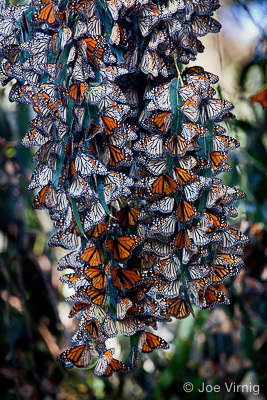 Joe thank you for the wonderful pictures of overwintering Monarch Butterflies! As a 'citizen scientist' I collect Monarch eggs and raise and release the healthy adults. This year I was surprised to find eggs late in Nov. Now that the cats have morphed into chrysalis, I'm looking for a place to release the soon to be adult butterflies. The place in your article sounds wonderful. 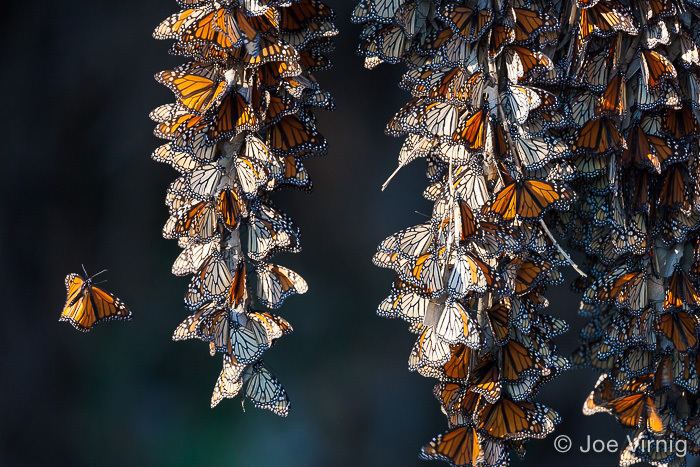 You really capture the wonder of Monarchs in your photos!